rocky's bru: Be scared, be very scared, Justo to tell "the real story"
Be scared, be very scared, Justo to tell "the real story"
Well, they cheated him of US$2 million (and this before the dollar climbed dramatically against the Ringgit and the Baht!) and he's staring at the prospect of three years behind Thai bars, so you'd understand if he's mighty pissed off. 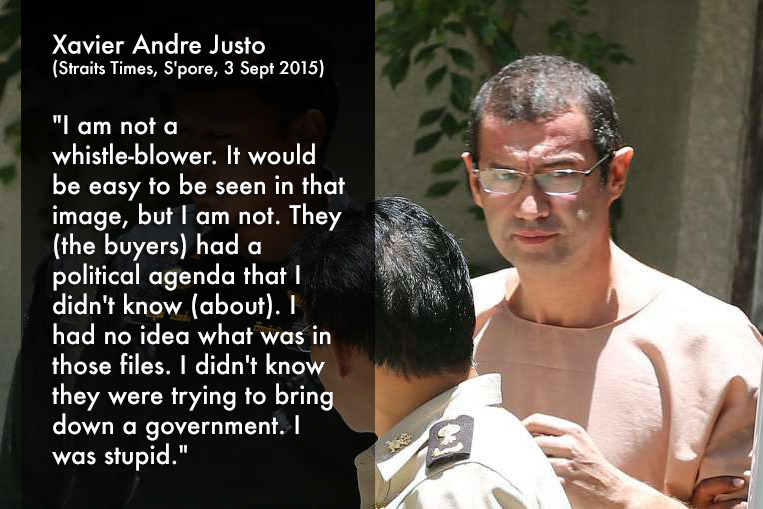 "I want people to know the real story," Justo told the NST Straits Times (Singapore). Well, don't expect me to be sympathetic, but bring it on, Andre! Xavier Andre Justo, the Swiss national held in a Bangkok jail on a blackmail conviction - and embroiled in a financial scandal involving Malaysian politics - plans to appeal against his three-year jail term, he told The Straits Times. "I wasn't expecting three years," he said. Justo was sentenced on Aug 17, but had expected his cooperation with police and a full confession to draw a lighter sentence. He has until Sept 17 to file an appeal. In the interim, he is looking for a new Thai lawyer, he said from Bangkok's Klong Prem remand prison, where he is serving his sentence. His Swiss lawyer Marc Henzelin was present at the interview. Asked if the details of his confession - and the transcript of a WhatsApp chat he had with the group that made an offer to buy his stolen data in a deal struck in Singapore - had been given to the Malaysian police, he said: "I have no idea." He had not been contacted by anyone from Malaysia, he said. He lashed out at references to him as a "whistle-blower" who sold data he stole from his former employer PetroSaudi, which contained details of a deal between the Saudi energy firm and Malaysia's troubled state investment firm 1MDB. Malaysian Prime Minister Najib Razak heads 1MDB's advisory board. "I am not a whistle-blower," Justo said. "It would be easy to be seen in that image, but I am not. They (the buyers) had a political agenda that I didn't know (about). I had no idea what was in those files. I didn't know they were trying to bring down a government. I was stupid," he claimed. Justo, who had quit PetroSaudi in 2011, demanded 2.5 million Swiss francs (S$3.7 million) from PetroSaudi's chief executive in 2013 for not divulging information he held on the company. The firm had paid him off once before and refused to pay him again, instead filing a complaint with the Thai police in May this year. In June, he was arrested at his plush home on the Thai resort island of Koh Samui. In an exclusive interview with The Straits Times on July 23 while in remand, Justo revealed that he was promised US$2 million (S$2.8 million) - which he was never paid - for the stolen data by Malaysian businessman Tong Kooi Ong, owner of The Edge Media Group. He claimed those he met over the negotiations, including Sarawak Report editor Clare Rewcastle- Brown, had talked about using the data "to try to bring down the Malaysian government" and had talked of plans to "modify" the data. The day the revelations were published, Mr Tong in a joint statement with The Edge Group publisher Ho Kay Tat acknowledged that they had misled Justo into believing he would be paid. "That was the only way to get hold of the evidence to expose how a small group of Malaysians and foreigners cheated the people of Malaysia of US$1.83 billion," they said, denying that they modified any data. On Tuesday, Justo, barefoot and in prison-issue dark blue shorts and light blue cotton shirt, said he was being treated "better than expected" in prison. "I eat three meals a day. I shower twice a day. Everyone, from the inmates to the officers, has been nice," he said. Apart from The Straits Times, he has spoken separately to at least two European news outlets. "I want people to know the real story, not just anything and everything written about me," he told The Straits Times. Yang merasuah masih tak takut. Di mana sebenarnya peranan Justo dala, kes PetroSaudi ni? Kalau bukan dia yang membongkar, rakyat Malaysia mungkin masih bodoh untuk mempercayai kata-kata seorang perasuah. Kes justo sudah basi, hanya kebodohan umno menggunakan senjata lawan sebagai pelindung diri sendiri. UMNO masih berada dalam kebodohan yang melampau. Dana RM2.6B, isu yang terang benderang juga gagal diselesaikan, lagi dicerita, lagi jelas ianya adalah rasuah. Awalnya nak saman WSJ, kenapa tak saman. Bacalah akta SPRM, jelas ianya rasuah. He better be quick to spill all if indeed he has anything to spill. Your boss situation don't look good with all these accusations going around him.He has already lost the perception war as almost all have found him guilty other then those in his payroll like your good self. And with the International Anti Corruption Conference (IACC) now being held here in Malaysia, the whole world is asking for an answer from your boss where did the USD700m comes from. They need a name not just an anonymous donor.For this country sake we really hope this donor really do exist or else our currency and our economy will be drag down the drain by your boss actions.He have virtually taken out all those who are going to be a threat to him and god knows how long this saga is going to end. Is this your best defence for Najib? Kena data-mine betul -betul ni nak cari nuggets yang berguna. Let's see the connection between Justo's confession and Najib's accounts. Be scared, be very scared indeed. What's there to be afraid of. He never said he tampered with the files. Why did PSI pay him if the data he had was false. Surely no one succumbs to blackmail if the evidence held is false.So one can easily conclude whatever he had and gave away is real . So the one to be afraid would be those who stole money fro the peole. "That was the only way to get hold of the evidence to expose how a small group of Malaysians and foreigners cheated the people of Malaysia of US$1.83 billion," now that's the truth..
What will now come out from the castrated AG, MACC and BNM will be according to the script written by Bugis Warrior sans teloq. BTW you langsung tak malu ke mati matian support a corrupt man? Dato no matter how much you tried to spin to save Najib, it simply wont work any longer. 2.6 billion is inside Najib personal account and was closed later with "some" balance of money transferred to a Singapore's bank. Justo was another issue and these two aren't related. Scared, of him telling his story which he has more or less said? Also how can he not know the contents of the docs if he was blackmailing his previous employer? you are right, najib should be scared , be very scared. What if this guy has a truth that can benefit the highest bidder? Surely there are lots that you can do with USD700 mil..
And, in the name of fair reporting, can you publish what the former premier said in his blog, about why he was there at that yellow rally? Ordinary simple Malaysian wants to live in peace in this beloved nation of ours. The problems are with politicions of both side together with their ball polishers & their prepaid & postpaid bloggers. So if that Swiss guy & the Sarawak Report guy have something to tell, bring it on. Ordinary Malaysian are not scared .... we have been politicking too long, lets get it over once & for all. Don't let our future generations suffer because of us. May Allah bless us all. He will implicate all of Najib's cronies. Can the 10 persons come forward please. They have been scheming to get Najib to resign. I'm not intrested in how he was tricked by the buyers what so ever. I'm more intrested and all i want to know is the content he tried to sell that worth 2 millions about a company link with 1imdb. What is the secret that worth more than 2 million and what is petrosaudi trying to hide from public. If it's a legit bisness deal i don't think they need to hide anything and there is nothing justo can extort from them. You are become very selective on the blogs that are posted herein or shall I say just like your paymaster or ex-pay master crafty half breed Mahathir. That is not the spirit of blogging, that is if you can call yourself a blogger. You don't even have my answer to what you have to say being published ? Yup thanks to Justo. Thanks to WSJ. Kalau tidak sampai bila2 lah pemimpin merosakkan negara sendiri with impunity !